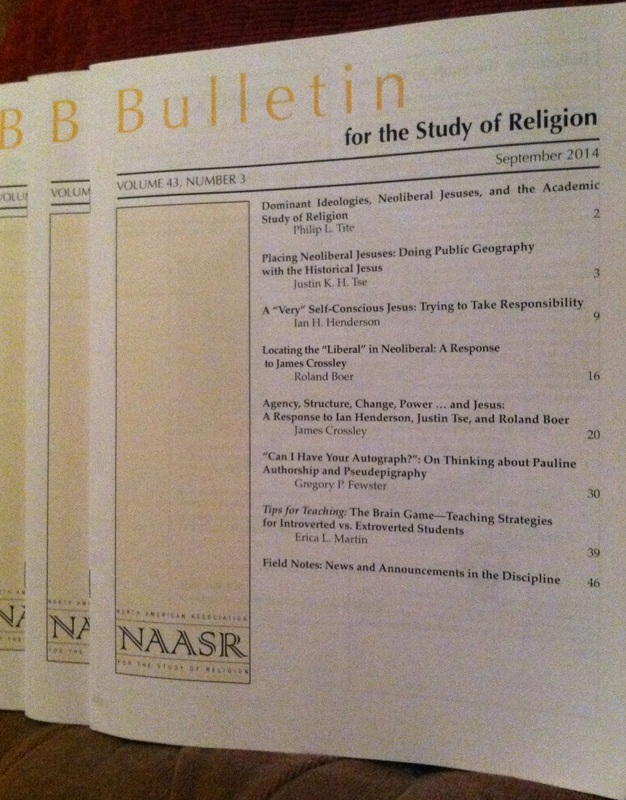 The following is the editorial introduction to the September 2014 issue of the Bulletin for the Study of Religion (the full table of contents having already been posted). We offer this editorial here on the blog in order to give readers an overview of the most recent issue of the Bulletin. Over the past month, my students and I have worked through a good portion of the Guide to the Study of Religion (Braun and McCutcheon 2000). This is an amazing collection of essays that both reflect upon a wide range of trends in the field of religious studies and mark out a theoretically and critically mature path for future scholarship. A running theme throughout the collection is a distinction between theories that focus on substantive approaches to religion (i.e., what religion is) and more discursive approaches to religion (i.e., what religion does). This theme is prominent, for instance, in William Arnal’s excellent overview of definitional approaches as well as in Russell McCutcheon’s engagement with the category “myth.” Often substantial approaches tend to focus on internal sui generis characteristics, thereby essentializing the object of study—and thus render it an object for study—so that a normative, universal reconstruction emerges under such labels as religion, myth, gender, ethnicity. Such normative products are often dissociated from not only cultural institutions (within which the object functions) but also—perhaps more so—the social and political circumstances of intellectual inquiry (within which the object functions for scholarship). More often than not, many of us who work within the academic world are unable to see the contemporary ideological influences at work within our guild—or in our own scholarship. And while concern over content certainly has its place within religious studies scholarship, it is always helpful to enter into reflexive modes of theorization so that we can discern such ideological uses of the very content that we create during our ordinary, scholarly activities. This issue of the Bulletin offers a panel of papers on a specific arena of research in which such ideological influences are vividly at play in research. James Crossley’s Jesus in an Age of Neoliberalism (2012) is a provocative history of scholarship on historical Jesus research (HJR). Building on his previous book, Jesus in an Age of Terror (2008), Crossley explores the dominant ideological, political, and economic trends at play within modern (largely Euro-American) HJR. Rather than exploring shifting methods for explicating the historical Jesus, Crossley’s history situates HJR within the context of neoliberalism. This is a work that is undoubtedly one of the most theoretically sophisticated works in HJR. Rather than offering scholars more tools to reconstruct the historical Jesus, he offers a mirror for HJR scholars, thereby demonstrating that HJR (and religious studies scholarship more generally) is just as historically, culturally, politically, and even economically situated as our supposed object(s) of study. We are delighted to include in this panel three responses to Jesus in an Age of Neoliberalism. Each response offers a distinct perspective for the conversation that Crossley launches. Justin Tse’s expertise in geography of religion adds to the theoretical spectrum of the conversation, while Ian Henderson offers a discerning viewpoint both as a teacher and a HJR scholar. Finally, Roland Boer deepens the conversation with a debate over critical theory. Crossley’s reply to these papers continues the conversation, thereby challenging his respondents and readers to keep pushing along these necessary lines of critical inquiry. This issue also includes two articles outside the Crossley panel. Gregory Fewster reassesses the discourse of “authorship” in biblical debates over Pauline pseudepigraphy, while Erica Martin’s contribution to our Tips for Teaching section challenges us to rethink how we, as teachers, can effectively engage both introverted and extroverted students. Closing off this issue, we have a set of Field Notes – specifically, the IAHR’s call for papers and the November programs for NAASR and SORAAAD. As always, we welcome news and announcements for both Field Notes and the Bulletin’s blog. Braun, Willi, and Russell T. McCutcheon. 2000. Guide to the Study of Religion. London: Cassell. _____. 2012. Jesus in an Age of Neoliberalism: Quests, Scholarship and Ideology. Sheffield: Equinox. This entry was posted in Call for papers, Editorial, Pedagogy, Philip L. Tite, Politics and Religion, Religion and Theory, Theory and Method, Theory in the Real World and tagged authorship, Bulletin for the Study of Religion, classroom, Cognitive Science, Conference announcement, Erica L. Martin, extroverted students, geography, Gregory P. Fewster, Guide to the Study of Religion, historical jesus research, Ian H. Henderson, introverted students, James Crossley, Jesus in an Age of Neoliberalism, Justin K. H. Tse, learning, Marxist ideology, NAASR, neoliberalism, New Testament studies, Pauline studies, pseudepigraphy, Religion, religious studies, Roland Boer, Russell T. McCutcheon, scholarship, SORAAAD, teaching, Willi Braun. Bookmark the permalink.